(AFP) - Liberians head to the polls on Tuesday to elect a successor to President Ellen Johnson Sirleaf, with hopes for a leader who will kickstart the economy and safeguard a fragile peace. Sirleaf will step down after 12 years at the helm of Africa's first republic, whose back-to-back civil wars (1989-2003) and Ebola crisis (2014-16) have stunted growth and left Liberia among the world's poorest nations. Twenty candidates are vying to replace Sirleaf, with footballing icon George Weah, incumbent Vice President Joseph Boakai, longtime opposition figure Charles Brumskine and soft drinks millionaire Alexander Cummings considered front-runners. Just one woman is seeking to follow Africa's first elected female head of state -- model-turned-humanitarian MacDella Cooper -- but she has near-zero chance of winning, diplomats and analysts told AFP. The elections of a president, vice president and members of the House of Representatives are a "crucial test for the democratic process in Liberia," Maria Arena, chief observer of the European Union, told journalists in Monrovia this week. "A peaceful transition from one elected president to another is important not only for Liberia but also as an example for the region," she said. Such a transition would be the first in living memory after seven decades of coups, assassinations and exiled dictators. 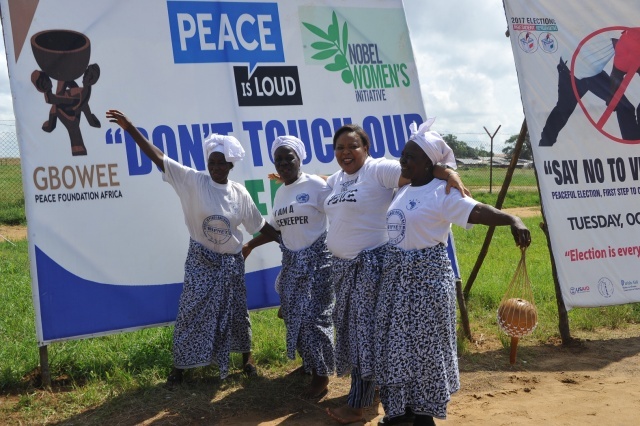 While ordinary Liberians are grateful that peace has held through Sirleaf's two terms in office, living standards in Liberia remain dire for most and have become the focus of the campaign. "We are doing everything ourselves to survive," Emmet Garokapee, a market trader, said as his head was shaved with a single razor blade at a backstreet barber for lack of electricity. Liberia ranks 177 of 188 countries in the UN's Human Development Index and 174 of 190 nations in the World Bank's Ease of Doing Business Index, and every candidate has laid out their plans to change the nation's gloomy outlook. Vice President Boakai has made infrastructure, especially road building, central to his campaign. But he faces accusations his government did too little on corruption and spent two terms pressing for donor funds abroad rather than innovate at home. Sirleaf, in her defence, said in an October 2 speech that "if we did not have those (UN) agencies and those programs here, with our limited resources we would not have achieved the things we wanted." But candidates such as telecoms tycoon Benoni Urey have lashed out at what he calls a "dependency" on foreign aid. A former executive vice president at Coca-Cola, Cummings cites handling a budget larger than that of Liberia's government as evidence of his competence to lead, and he is seen as the dark horse of the campaign. Development, Cummings said at a rally on Thursday, "is not too much to ask of ourselves after 170 years," in reference to the nation's founding by freed African-American slaves in 1847. Liberia's most famous son, footballer-turned-senator George Weah, attracts huge crowds and has a faithful youth following in a country where a fifth of the electorate is aged 18 to 22, but is blamed for issuing vague promises and for his long absences from the country. Liberians have praised the nation's first presidential debates, which were held in Weah's absence. Some also question his pick for vice president -- Jewel Howard-Taylor, the ex-wife of Liberian warlord and former president Charles Taylor. Charles Taylor is currently serving time in Britain for war crimes committed in neighbouring Sierra Leone, and rumours swirl he is issuing orders by phone from his jail cell. Weah denies contact with him. While campaigning has been "largely peaceful" according to the NEC, with just one clash between Weah and Brumskine supporters, some Liberians remain worried after sparks of violence at the last elections in 2011 that killed two people. "We are just praying for free and calm elections," said Tina Davis, a wigmaker working at a stall in the Joe Bar market of Monrovia. One women's group has even held fasting and prayer sessions for three weeks in an echo of their actions towards the end of the civil war, when they forced warring parties into dialogue. The group coordinator Delphine Morris told AFP several premature "victory marches" could turn violent if there is a disputed result. The election is the first national-scale test for Liberia's police and army since the war after taking back control of national security from the country's UN peacekeeping mission just last year. Peacekeepers would only step up "in the event of a deterioration of the security situation that could risk a strategic reversal of peace and stability in the country," UN spokesman Shpend Berbatovci told AFP. Polls will open at 8am (0800 GMT) and close at 6pm (1800 GMT) for Liberia's 2.1 million registered voters, with the first provisional official results expected within 48 hours, according to the National Elections Commission (NEC).